Tuesday January 2nd, we will be having our monthly community meeting. This month we will be meeting at 415 Westlake, starting at 5pm. This month we are pleased to welcome Brennon Staley from the City of Seattle’s Office of Planning and Economic Development. The council is looking at the impact of development within South Lake Union and funds made available for neighborhood projects after the latest zoning changes. Community Council will have updates from our standing committees, recapping what the council has been up to this last month, including updates on Park Activation, Policy and Planning, Place Making Transportation, and Design Review. Please join us Tuesday January 2nd at 415 Westlake starting at 5pm! Please join us for our monthly South Lake Union Community Council meeting at 4pm on October 3rd, 2017 at 415 Westlake. *Executive Action* The South Lake Union Board of Directors will vote on the designation of 8th Ave N between Thomas and Harrison as a “Festival Street.” The Board will take into consideration the recommendations from the August 13 meeting of the Policy and Planning Committee. Please attend our meeting to learn about the festival street designation and the benefits it provides to our neighborhood. This month we will host a discussion on the Memorandum of Understanding with the Oak View Group on the renovations planned at Key Arena, and potential impacts on our growing neighborhood. Come learn about our South Lake Union parks, South Lake Union is the proud home of Denny Park (Seattle’s Oldest Park), Lake Union Park and Cascade Park. We will be talking about park activities, recent capital improvements, and other topics involving our neighborhood green spaces. Our monthly meeting is open to all, feel free to bring friends, neighbors and colleagues. We look forward to seeing you on October 5th! 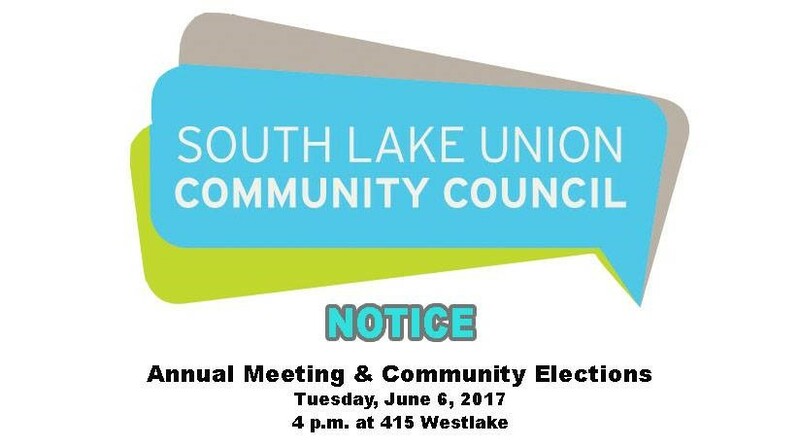 Please join us for our monthly South Lake Union Community Council meeting at 4pm on September 5th, 2017 at 415 Westlake. This month’s meeting will be focused on Bikes! Topics will include discussions on the new Bike Share programs, SDOT’s bicycle infrastructure improvements including mobility into and thorough the neighborhood, and a presentation from the Cascade Bicycle Club advocacy team. Our monthly meeting is open to all, feel free to bring friends, neighbors and colleagues. We look forward to seeing you on September 5th!